A new approach to eyelash transplantation is being hailed by a renowned medical publication called Plastic and Reconstructive Surgery Global Open Journal. In mid-March 2015, the PRS GO released a new study by Sanusi Umar MD on the use of leg hair as a more natural looking graft choice for fuller,longer eyelashes. Not everyone has the genes to grow long lashes. Therefore, eyelash hair transplant surgery might seem like a logical way to solve this dilemma. However, due to available technology, standard procedures only use hair from the scalp. Yet, head hair is thicker and grows faster than eyelash hair. It also needs to be trimmed curled (or professionally permed) very regularly to prevent the lashes from growing downwards, or into the eyes. For these reasons, eyelash transplantation has long been reserved for cases where lashes have been lost due to diseases burns or accidents. A technology has been developed by Dr. Umar (associate faculty of UCLA’s dermatology division and owner of Dr. U hair and skin clinic in Los Angeles). It is known as UGraft. Due to its specially designed features, the device offers new possibilities for eyelash transplant procedures in most individuals. 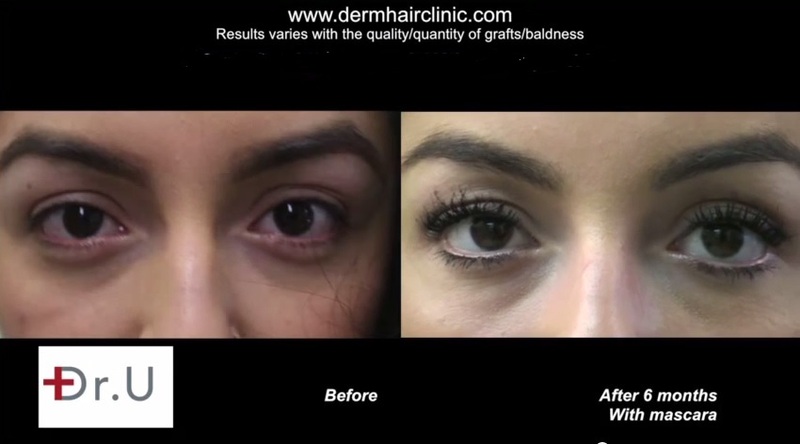 Since head hair is too thick and grows quickly, it makes sense to choose other types of grafts. More natural looking and ideal lashes can be created by using thinner leg hair, which grows short lengths and is similar to real eyelash hair. And it is suitable for nape and other types of body hair. Since leg hair bends at an angle before it emerges out of the subcutaneous tissue, it is likely to be damaged by the basic cylindrical punches that are used in standard hair transplant practices. In this study ,Dr Umar performed eyelash transplantation on two female patients, using leg hair in one surgery and nape hair for the other. With these thinner grafts, both patients were able to achieve successful growth and more natural looking, softer looking fuller eyelashes. Leg hair also entails less maintenance. Compared to the nape hair case, the patient with the leg hair insertions reported trimming her eyelash only every 5-6 weeks instead of every 2-3 weeks. Again, leg hair grows at a much slower rate. Also the shafts are more malleable. Therefore, she is able to use simple DIY home curlers without the need for monthly salon visits to perm her lashes which often becomes a regular routine for eyelash transplant patients who expected to undergo this practice for the rest of their lives. For years, women with genetically short lashes have longed for a way to just wake up in the morning with longer, natural looking eyelashes. So far, they’ve had to settle for the use of prescription solutions Like Latisse ™ (which require lifelong usage), false lashes and eyelash extensions (which can result in permanent loss of eyelashes in the long term). Now due to Dr. Umar’s newly developed methods, it is possible for some individuals to have their very own set of lengthy, fuller lashes and brows as a true reality, despite what they were born with.